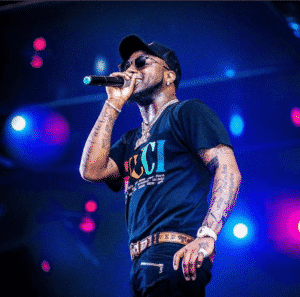 We often see artistes gift their belongings to fans during performances but Davido experienced the opposite during his performance at the ‘Son Of The Soil’ concert in Ile-Ife, Osun State. The singer recently visited his state of origin, Osun state; and one of the places he stopped at was the palace of the Ooni of Ile-Ife. Davido paid a visit to HRM Oba Adeyeye Enitan Ogunwusi in his palatial palace; and pictures of the visit surfaced on the internet. It appears Davido treated his fans in Ile-Ife to a fine music performance at a Son of the Soil concert. The audience at the event pulled a surprise as they showered the singer with gifts while he was on stage performing his early career hit song, Dami Duro. The singer received what looks like a piece of art work, as well as a jacket from his fans; and he looked delighted to have receieved the gifts. #Davido receives various gifts on stage from fans during performance at #SonOfTheSoilConcert #IleIfe #GoldMyneTV . . Watch the full video on GoldMyneTV App on Sunday 8th of July, 2018 by 8pm. Follow link our bio now to download the app.